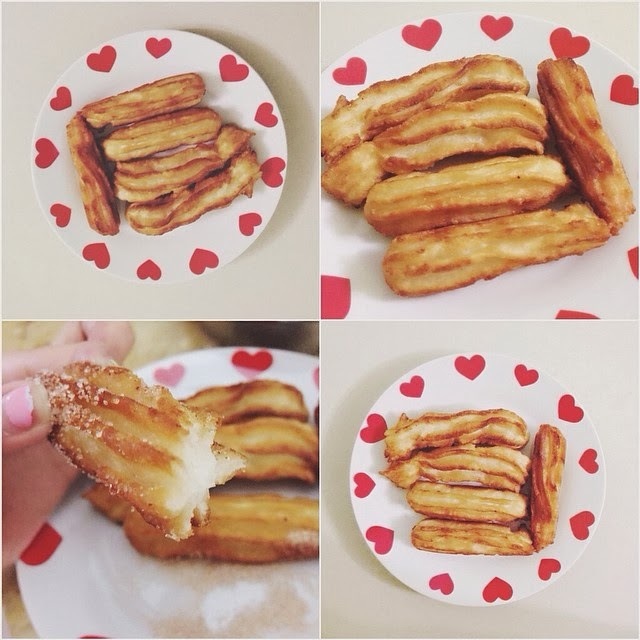 It has been long since I share a recipe with you guys so I decided to do a very simple BUT super duper yummy recipe post hehehe. From the title you all know it's churros la and I'm pretty sure some of you guys don't even know what's churros right ?! Cox actually I didn't know until I got them from USS lol and it's mega yummy lah! It's like a must buy everytime I go to USS but it's so expensive lor, $4.50 for one stick, when are you need is like 3 cheapo ingredients lol. It taste just like donuts actually! It's just deep fried dough covered with cinammon sugar/chocolate dip or whatever you like. 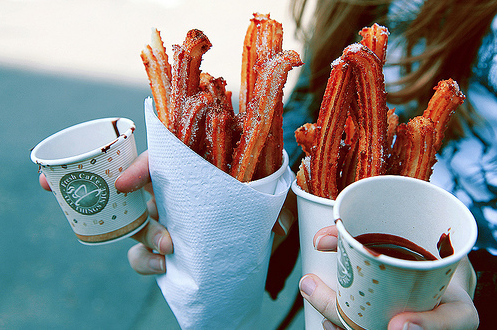 Usually if you get churros outside it comes in a longer stick but for mine I just make it around the size of my fingers so it's easier to bite. 1. Add salt to water and bring it to boil. 2. Add in the flour and mix well. 3. Let the dough cool down for 15 minutes. 5. 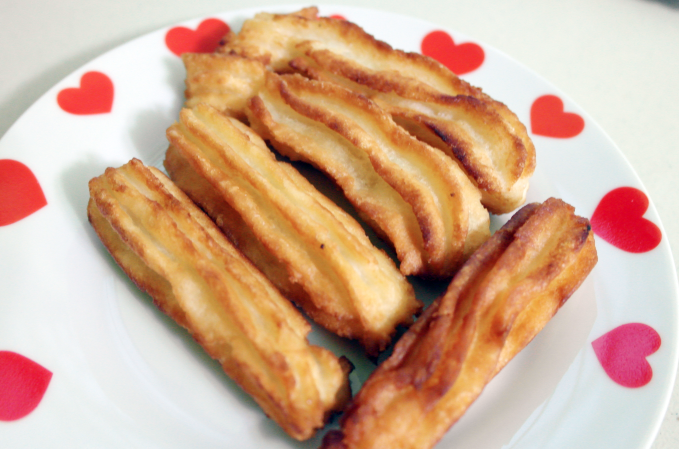 Deep fry the churros until it turned golden brown. 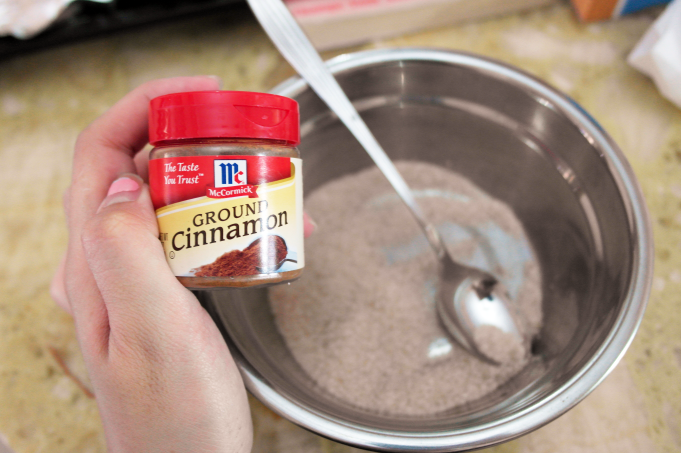 For the toppings, mix the cinnamon powder and sugar together to make cinnamon sugar. You can adjust according to your liking! For example if you like it sweeter you can just add in more sugar. 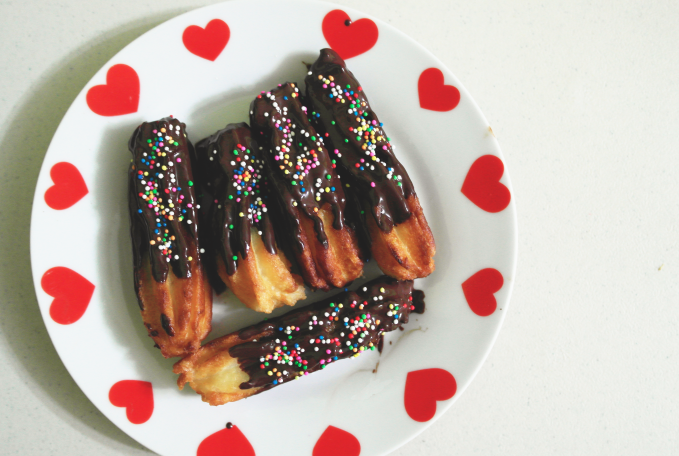 I also tried coating my churros with chocolate and top it off with some rainbow sprinkles and they look extra pretty!!!! Don't you feel that rainbow sprinkles always makes food happier?! hahaha. Personally I love both of the toppings but I guess most people will like the chocolate one more because it's sweeter!